Christ Church is a popular venue for weddings, and we look forward to welcoming couples for a special day. 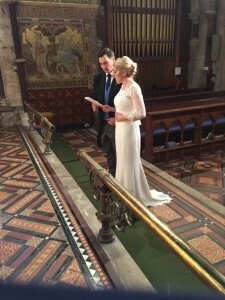 If you have lived in the parish, or if you are on the electoral roll of the church, or have a qualifying connection with the parish you may have a right to be married here. You should contact the Team Vicar Revd David Guest via email before you firm up any dates and bookings for a reception. He will arrange a time to meet you and complete the necessary legalities. You will need to bring your passports to that meeting. If one of you has been married before it may still be possible for you to be married in church but we cannot confirm this until meeting with you. You will also need to produce the original Decree Absolute so that a copy can be taken and put on file.